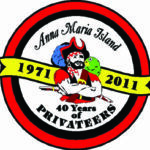 To the Anna Maria Island Privateers: A toast to those who do the most. Whether you love them for the scholarships they award, the parades on Fourth of July and at Christmas, the Privateers bring color, spirit and excitement to Anna Maria Island. They are synonymous with the rowdy Island nature of the past, and the cheer they promise to bring to young and old in the future. The 40-year anniversary has been an all-out celebration of Privateer proportions, from captures at all three Island cities — who doesn’t love the sight of their mayor shackled to the Privateer ship awaiting the payment of ransom and delivery of the key to the city? — to new, fun events that included a Pirate soup cookoff, and a grog party. 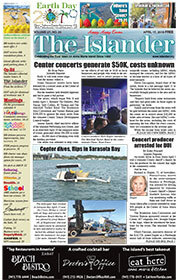 The Privateers added flavor this year to the Anna Maria City Pier Centennial event, Holmes Beach Founder’s Day and more. They also hosted their tried and true events, Thieves Markets, mullet smokes, Christmas for kids, including visits with Santa after the parade, and more opportunities for kids to visit Santa at community events, Bayfest and Cortez Fishing Festival appearances, and a party at the Manatee Public Beach on July 4 for all the many scholarship winners — all with revelry, cannons roaring, swords clashing, mayhem and “Arrrrrrgh.” Privateer trademarks. There was booty to be paid on Anna Maria Island to the Privateers, and, in turn, a bounty of scholarships were distributed — the highest dollar amount ever for the men and women of the benevolent Privateers. And perhaps you didn’t know, but for years and years, women were not allowed to be Privateers — in the tradition of the 17th and 18th centuries, when privateers were authorized to attack foreign warriors in place of or in addition to the naval fleet. And Privateers often captured pirates and recovered their hordes of stolen goods. Sometimes their investors profited from the booty brought back by the crew of Privateers. So think of Anna Maria Island as investors, enjoying the booty and the bounty provided by our Privateers. They provide a fabulous trademark for all the pleasures we enjoy on Anna Maria Island…. Paradise for Privateers. 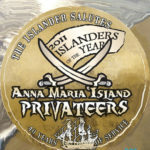 We salute you, AMI Privateers.